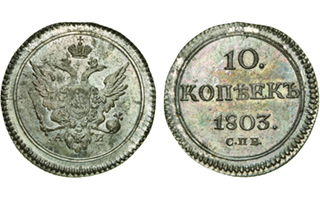 A group of rare 19th century Russian silver coins discovered among a large group of mostly worn common coins sent to Morton & Eden in London for valuation will be sold at auction June 10, 2014. Contained in old, small, paper envelopes, amongst hundreds of others holding coins of minimal value, were 39 minor Russian silver coins of the early 19th century in what is described as amazing condition. The coins had been sent to Morton & Eden for sale by a descendant of an eastern European family whose members had emigrated many years ago to the United States, according to the auction firm. Morton & Eden submitted the coins to Professional Coin Grading Service for grading. Of the 39 coins, 16 were graded Mint State 64, 11 were graded MS-65, one was MS-65+ and five graded at MS-66. The coins consist of silver 20-kopek pieces, 10-kopek pieces and 5-kopek pieces, dated from 1802 to 1825, all struck during the reign of Tsar Alexander I. Each is different, leading to speculation that they originally belonged to a set of coins, of which records have since been lost. ➤ An 1803 10-kopek piece, Bitkin 62 (Bitkin Catalog of Russian Coins 1699-1917), MS-65, estimated at £15,000 to £20,000 ($25,000 to $33,000). ➤ An 1812 5-kopek piece, Bitkin 255, MS-64, estimated at £8,000 to £12,000 ($13,000 to $20,000). ➤ An 1825 5-kopek piece, Bitkin 282, MS-64, estimated at £6,000 to £8,000 ($10,000 to $13,000). The total estimate for the group is £70,000 to £90,000 ($116,000 to $150,000). The collection will be auctioned by Morton & Eden in Sotheby’s sales rooms on June 10. For further information, visit Morton & Eden online at www.mortonandeden.com or email the firm atinfo@mortonandeden.com.